Google аналитика вам пружа ажуран увид у то како посетиоци користе ваш сајт, како су стигли на сајт и како можете да их мотивишете да га поново посете. Захваљујући налогу Google аналитике, можете да разложите податке из различитих извора веб-саобраћаја, укључујући AdWords кампање. То вам може помоћи да измерите општу успешност оглашавања на мрежи. Да бисмо поједноставили ваше искуство, омогућили смо да неки од статистичких података Google аналитике, као што је стопа посете само једне странице, буду видљиви у оквиру AdWords налога како би AdWords корисници могли да им приступе. На тај начин можете да остварите детаљнији увид у кампање и да на основу тога на истом месту предузмете кораке. Изабрани подаци Google аналитике су доступни на AdWords налогу на нивоу кампање и огласне групе. „Стопа посете само једне странице“, „Прос. трајање посете“ и „Странице/посета“ су колоне које можете да омогућите на картицама „Кампање“ и „Огласне групе“. Захваљујући статистици о интеракцијама из Google аналитике која је приказана поред статистике учинка из AdWords-а, можете из прве руке да сазнате шта људи раде када стигну на одредишну URL адресу након што су кликнули на ваш оглас. Овај увид у интеракције након клика пружа још један приказ ефикасности кампања и огласних група, што вам може помоћи да донесете одлуке о буџетима, понудама, одредишним страницама и садржају огласа. На пример, приказ стопе посете само једне странице за огласну групу поред података за стопу учесталости кликова може вам пружити детаљнији увид у ефикасност дате огласне групе. Ове детаљне информације могу вам помоћи да донесете одлуку о томе како да осмислите и направите огласне групе. Више информација, укључујући то како да активирате ове колоне у вашем AdWords налогу, пронађите у AdWords Центру за помоћ. 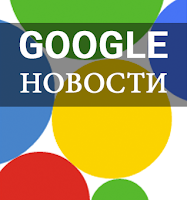 Новости из Google-a за период 1.10. до 21.10.2012. Преносимо вам најновије вести са званичних блогова Google производа. Као и обично, вести преносимо на изворном енглеском језику. As we’re nearing the end of 2012, we’ve all got business goals to meet. Some of you might even be prepping for your busiest season. Today, we’re announcing our next series of Learn with Google webinars, which will arm you with the tools you need to get the most out of your holiday ad dollars. Back in June, we responded to feedback about changes to how ad rotation works in AdWords. In early November, AdWords impression share (IS) reporting will get some improvements to give you better insights, including new columns and hour of day segmentation. Along with these improvements, we’re also announcing some changes in the availability of certain historical IS data. Today there’s a rich suite of tools allowing marketers to gain better insights, reach audiences in new ways, and develop improved marketing campaigns so users have better web experiences. Yet many modern marketing tools—like web analytics, conversion tracking, remarketing, and more—depend on adding "tags" to your website. Last year we announced the beta launch of Real Time Analytics. We knew it would be an addictive feature but we were blown away seeing the growth and usage. In fact, we now have over 7 years worth of engagement with the feature every day! Google Analytics users already know how useful it is to analyze advertising and web data together. Now we’re making it possible to use your Google Analytics data right in AdWords. After setting up AdWords to import your Google Analytics data, you’ll have access to key metrics like Bounce Rate, Pages Per Visit, and Average Visit Duration directly in the AdWords interface. With more performance data available right where you’re managing your campaigns, you can make better informed decisions and improve your AdWords ROI. Earlier this year, we launched The Mobile Playbook in the US to help brands and agencies develop winning mobile strategies. At the time, most marketers had already moved beyond the “why mobile?” question, but didn’t know where or how to get started. Now it’s become clear that, when done right, mobile works for marketers. So what is the meaning of mobile? That’s a big and complex question, but to start scratching the surface we sought the help of an anthropologist who went into the homes of mobile users and spoke with them at length, observing their device interactions and asking them to keep “mobile diaries” to understand the role mobile is playing in their lives. The new Chromebook is a great computer at any price, but it’s an incredible computer at $249. It’s one of the lightest laptops on the market. You can easily carry it around all day—it’s 2.5 pounds, a mere 0.8 inches thick, with more than 6 hours of battery life for the typical user. Today you can discover 42 new online historical exhibitions telling the stories behind major events of the last century, including Apartheid, D-Day and the Holocaust. The stories have been put together by 17 partners including museums and cultural foundations who have drawn on their archives of letters, manuscripts, first-hand video testimonials and much more. Much of the material is very moving—and some is on the Internet for the first time. Како бисмо рефлектовали данашње границе Републике Србије и Републике Црне Горе, недавно смо омогућили корисницима AdWords-а да одвојено циљају кориснике у ове две државе. Локацију за циљање "Serbia Montenegro" делимо на две локације - "Србија" и "Црна Гора". То значи да ћете од сада моћи да независно циљате кориснике у Републици Србији и/или Републици Црној Гори. Ускоро ћемо извршити укидање локације "Serbia Montenegro", а ако ваше кампање тренутно циљају ову локацију, додаћемо уместо ње две одвојене локације за циљање - "Србија" и "Црна Гора". Ако не промените подешавања, ваше постојеће кампање које су до сада циљале локацију "Serbia Montenegro" ће циљати обе нове локације. Саветујемо да пратите учинак ваших кампања током ове миграције локација за циљање, и да подесите ваша подешавања како би била одговарајућа за локацију коју циљате. Новости из Google-a за период 17.09 - 30.09.2012. 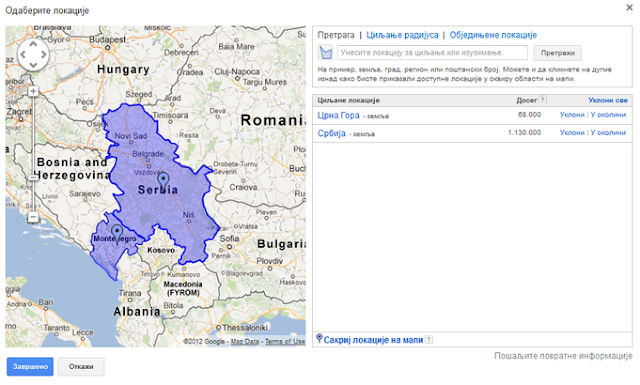 Преносимо вам најновије вести са званичних Google блогова које су обележиле претходне две недеље. Вести преносимо на изворном енглеском језику. In the spirit of making Google Maps more comprehensive and accessible to people around the world, today we’re introducing Google Street View imagery of Chile and Croatia. We hope that these images are useful to both locals who want to scope out their own neighborhoods as well as tourists who are planning trips to either of these scenic countries. We’re living in an always-connected culture -- in fact, the average American spends a full 2 months of their waking year online (emarketer, 2011). That’s time spent at work, on the go with mobile phones, and on the couch with tablets. With this wide array of screens, how do you reach your audience, and your performance goals -- at scale and with efficiency? The Google Display Network has the reach and technology to help get your message to the right customer, at the right time, all across the web -- no matter the device or channel. But putting together an optimized performance campaign to reach this fragmented audience can be a real challenge -- so we decided to bring you your very own toolkit -- The Google Display Network Playbook for Performance Marketers. In this world of constant connectivity, consumers expect to find the information that they want, when they want it - especially when they’re on the go. We know that this applies to their web browsing experiences on mobile, so we took a deeper look at users’ expectations and reactions towards their site experiences on mobile. Most interestingly, 61% of people said that they’d quickly move onto another site if they didn’t find what they were looking for right away on a mobile site. The bottom line: Without a mobile-friendly site you’ll be driving users to your competition. In fact, 67% of users are more likely to buy from a mobile-friendly site, so if that site’s not yours, you’ll be missing out in a big way. Earlier this year, mobile took the stage as a category at Cannes for the very first time. Earlier this week, we launched the Creative Sandbox Gallery, a crowdsourced collection of global campaigns that push the boundaries of creativity and technology across digital platforms. It’s becoming clear that mobile has truly arrived as a creative platform, and we can feel a new awakening brewing within the creative agency community around the possibilities of mobile.